Four British swimmers have won their appeal to ratify two world records set at the European Championships in 2014. The Court of Arbitration for Sport ruled in favour of Adam Peaty, Fran Halsall, Jemma Lowe and Chris Walker-Hebborn in their case against swimming world governing body Fina. The swimmers' world record times in Berlin were not recognised as they were not tested for banned substance EPO. But a Cas panel says the administration error should not negate the records. "The absence of EPO tests by the testing authority should not fall to the detriment of the athletes and lead to the non-recognition of the world records," read a statement from Cas. "For this reason, the Cas panel has granted the appeal and such records shall now be recognised." 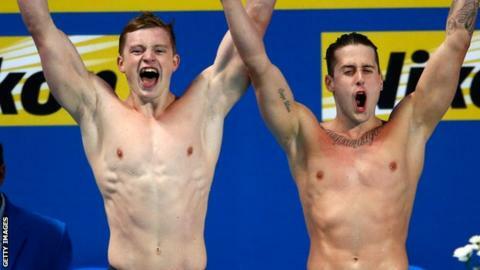 Peaty lowered the 50m breaststroke world record to 26.62 seconds at the championships and joined Halsall, Lowe and Walker-Hebborn in the mixed relay team that set a new mark of three minutes 44.02 seconds. Both marks have subsequently been surpassed, with Peaty setting a new world record of 26.42 at last year's World Championships in Kazan, while the relay team - with Siobhan-Marie O'Connor in Lowe's place - recorded a new mark of 3:41.71.